For centuries drainage has been considered a purely functional element of any design. So much so that it’s often something landscape architects try to squirrel away and hide – anything to ensure it doesn’t detract from the overall look and feel of the space that’s being created. Essentially drainage is viewed as a necessary evil, with metal grated systems a particular eyesore. All too often expensive slot drainage is the only solution left standing – purely due to the relative subtlety of the product, at least when compared to the alternatives. But that’s all now set to change. In a huge leap forward for the industry, landscape architects no longer need worry about how to incorporate drainage or conceal it from view. In fact, there’s now a reason to actively embrace it. Marshalls is the UK’s leading hard landscaping provider – and now we can supply drainage that blends with our concrete paving and natural stone ranges. With Drexus Pave Drain, Marshalls can provide a discreet natural stone topped drainage solution in the exact same material as the paving that surrounds it. This means the drainage can either blend into the landscape to effectively hide it, or be contrasted to offer some form of delineation to frame a public space and create a design feature. In short, drainage no longer needs to be a barrier to great design. With Drexus Pave Drain it can actually contribute to the aesthetic appeal and the functionality of an outdoor space. Pave Drain can be used as an effective delineator between pedestrian and vehicular areas instead of a line of paving – essentially killing two birds with one stone. It was recently installed at a hospital bus interchange where the drainage is being used as a delineator between the road and pavement. As emergency vehicles need access a kerb was inappropriate, but Pave Drain was still able to make the layout clear to both pedestrians and vehicles. 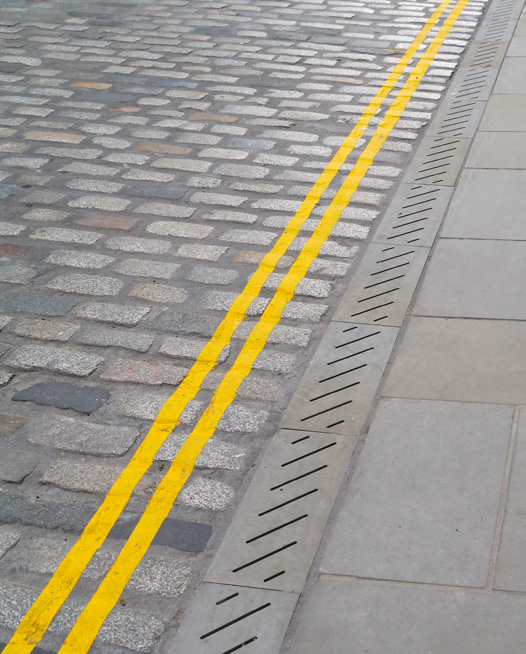 A line of drainage can also be supplied in a contrasting colour to be used as a border around a public space. As the product can now be rendered in the same texture and material, it no longer looks unsightly but instead functions as a design feature in its own right. At a time when living space is at a premium and keeps having to work harder, Drexus Pave Drain can provide subtle but effective demarcation, creating the sort of zoning that allows great public areas to do all that’s increasingly being asked of them. Where a landscape architect still wants to hide the drainage, it can now be created in the same material and colour as the surrounding paving – allowing it to be subtly integrated into the paving design. It means there is no longer any need to resort to ugly grates or expensive slot drains, marking a huge step forward for the industry. Thistle Street lies at the heart of Scotland’s capital city in Edinburgh’s New Town. Built in stages between 1767 and 1850, retaining much of its original neo classical and Georgian period architecture, the New Town is considered a masterpiece of city planning. Together with the Old Town, it was designated a UNESCO World Heritage Site in 1995. Engineers at Edinburgh City Council were looking to improve drainage around the walkways in this essentially flat area. With pedestrian safety and comfort in mind, they wanted to minimise the issues of ponding and standing water, creating effective channels and falls while retaining the character of these charming city streets. Marshalls’ Drexus Pave Drain provided the perfect solution, offering a unique aesthetic for linear drainage. 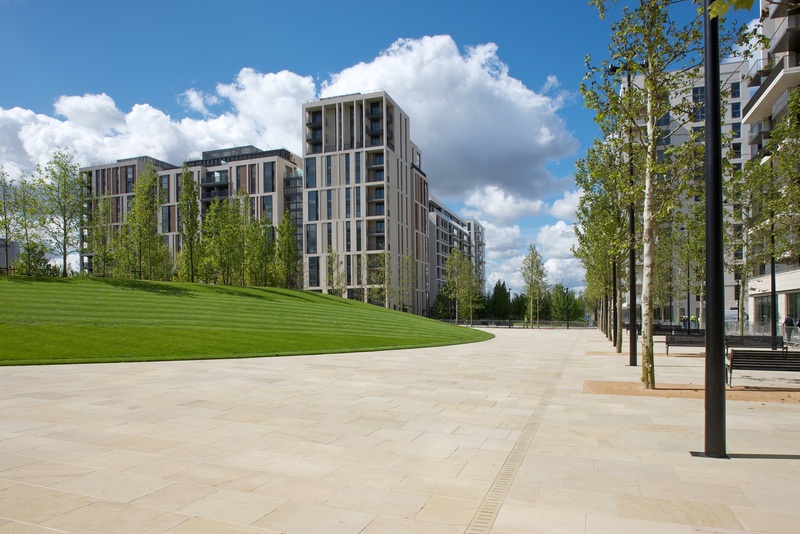 Utilising Marshalls’ expertise in both concrete and natural stone, Pave Drain offers an effective combined paving and drainage solution which perfectly complements natural stone paving products, including the Scoutmoor Yorkstone installed on Thistle Street. Available in a variety of designs and finishes, suitable for any public realm development, the Pave Drain concept combines a natural stone upper section complete with drainage slots and a concrete channel block which sits below the upper section, allowing surface water to drain away below the surface of the walkway. Heavy traffic isn’t an issue either. Pave Drain achieves a loading classification of D400, making it suitable for areas subject to vehicular overrun as well as pedestrian traffic, helping to create better landscapes for some of Britain’s most iconic sites. Dovetailing perfectly with existing hard landscaping products along Thistle Street, Marshalls Pave Drain is now playing an important role in maintaining safe and well-drained pedestrian walkways serving the shops and restaurants in this bustling and beautiful area of Scotland’s capital. The unique ability of Marshalls’ Drexus Pave Drain to sympathetically blend drainage into a scheme, or use it to provide subtle but effective demarcation, means it has the potential to play a game-changing role in the world of landscape architecture – and find a place at the heart of every kind of project imaginable.